Thousands of schoolchildren across Scotland and Scottish secretary David Mundell have been receiving the results of their National and Higher exams. It is understood that the Scottish Secretary lay under his letter box all night awaiting the post like some sort of mad Beagle. However, the wait proved to be worthwhile as Mundell received the prize he had been awaiting – a C in Higher Modern Studies. This grade will allow Mundell to either continue as Secretary of State for Scotland or take up a conditional offer of acceptance from Napier Uni. The first question of the Modern Studies exam was “Describe three ways in which the American political system differs from that of the UK” to which Mundell answered “NO TO SNP PLANS FOR A DIVISIVE REFERENDUM”. 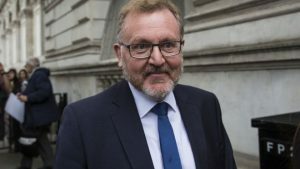 Mr Mundell has spent the year commuting between the political chambers of Westminster and night classes at Dumfries and Galloway college. “To spite having a Degree and being a Barrister, this is the crowning point of a fairly depressing career” beamed Mundell.